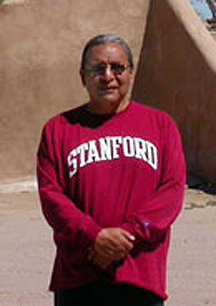 John Gonzales was born at San Ildefonso Pueblo in 1955. When he was a child, his family was "relocated" to a suburb of Chicago, Illinois, so he lived away from the Pueblo for the first 8 years of his life. John was an excellent student, receiving his Bachelor of Arts from Stanford University in 1980 and a Masters in City Planning from M. I. T. in 1982, after which he worked in a series of administrative and management positions. In 1987 he was elected President of the National Congress of American Indians, an organization representing tribes all over the United States. John was the youngest person ever elected to that position. In 1989 he accepted a position with the Bush administration as a consultant, working with Secretary of the Interior Manuel Lujan. He served on the Tribal Council of San Ildefonso for 8 years and was elected Governor of the Pueblo in 2002. In early 1991, John decided that he needed to return home to New Mexico and to reinvolve himself in Pueblo life. He had no expectation of the complete change in direction that his life would take. With the encouragement of his father, Lorenzo, a well-established potter, John immersed himself into the centuries old tradition of pottery making. He attributes the ease of his transition from a life in politics to a career in art to the assistance of his father and sister, Marie. They made clay, slips and polishing stones available, but, more importantly, they shared their expertise. It didn't take long for John to realize that he had a gift for working with clay. His doubts about whether he could make a living from his art work soon vanished. 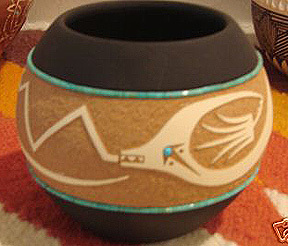 In 1995, events led John to become more involved with the Southwestern Association for Indian Arts, Inc. (SWAIA) organization, the sponsor of the world-class showcase of Indian art, the Santa Fe Indian Market. He served on the Board of Directors and served as Chairman in 1997. In October 1998 John was honored with being inducted into the Stanford University American Indian Hall of Fame. 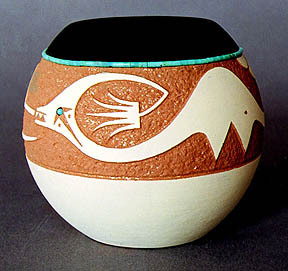 His pottery was selected for the re-opening exhibit of the Iris and R. Gerald Cantor Center for the Visual Arts at Stanford University.